Setting up a VPN on a router is much easier than most people think. They key is first choosing a good VPN service and then selecting the best VPN router for your needs – the rest is easy. 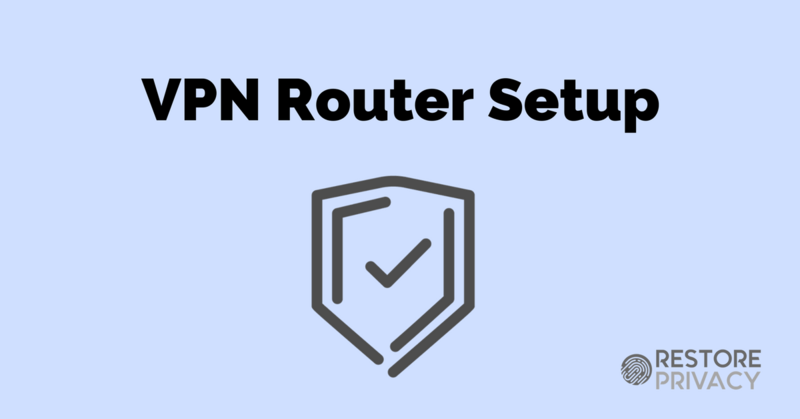 In this how-to guide we will cover a simple way to install a VPN router. 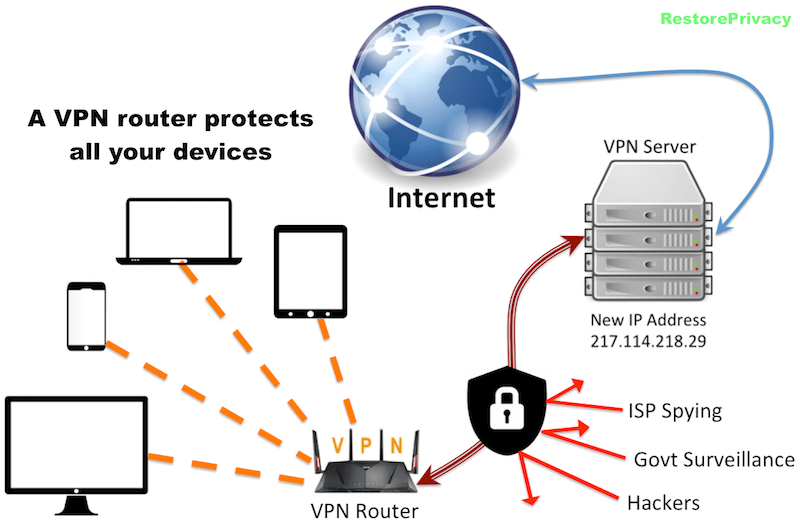 A VPN router is the best way to secure your home network and all devices. This is especially true if you live in a country where ISPs monitor and record online activity (United States, United Kingdom, Australia, and much of Europe). For this setup, we’ll be using VPN.ac. The only router brand that offers a wide selection of VPN-ready routers is Asus. The default Asus firmware, which is called ASUSWRT, supports OpenVPN, PPTP, and L2TP, right out of the box (no flashing required!). Assemble your router according to the instruction manual. 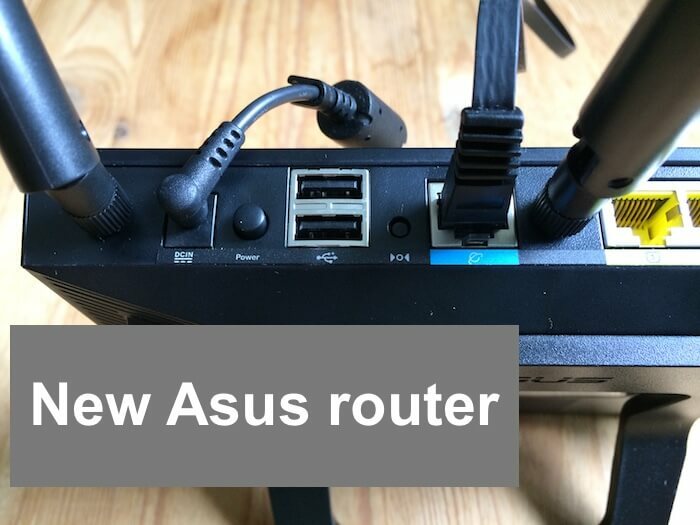 Then, connect your new Asus router to your existing router using the ethernet cable. 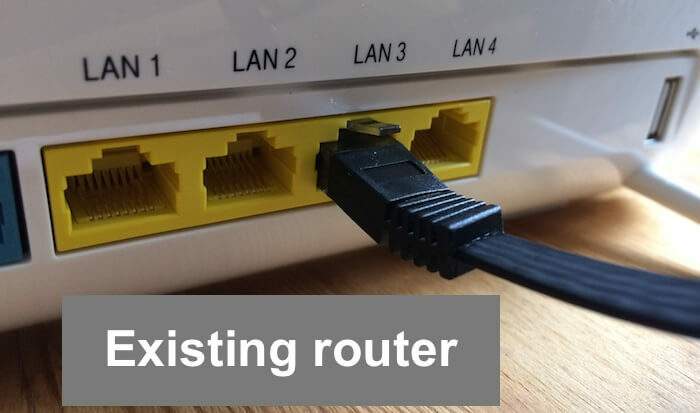 Notice which ethernet (LAN) ports are being used in the photos below (blue WAN port with the new router, and any yellow LAN port on the existing router). Connect the existing (old) router to the new Asus router with the ethernet cable. After turning on the power and waiting a few minutes, you can setup your new router. 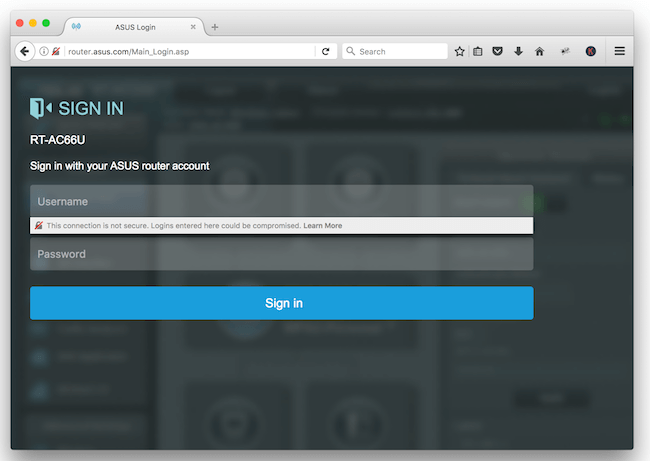 Find and select the “ASUS” network to configure your new router. You can now connect to your new Asus network. We’ll be using VPN.ac in the setup below, but this will work the same with any of the VPNs recommended above. You will need a subscription to VPN.ac, which you can get for $4.80 per month. Once you have a VPN.ac subscription you can get the OpenVPN files, which you’ll import onto your router. I’d recommend using the AES 256 UDP file. This provides you with the OpenVPN 256-bit encryption protocol, which is secure, fast and reliable. 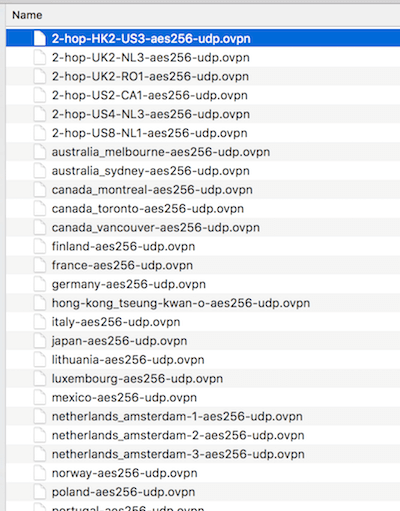 When you open the zip file you’ll see a list of individual .ovpn files. Each file corresponds to a specific server location (or a double-hop server configuration, see “2-hop” servers below). Sign in to your administration area with your username and password from earlier. Now select the following: VPN (left side of the screen) > VPN Client (top) > Add profile > OpenVPN. Now enter the following information into the OpenVPN window. Click Browse, open the .zip file from earlier, select which encryption folder you want to use (160 or 256) then select the specific server you want to use, click open. Now click Upload to upload the .ovpn file. You don’t need to import the CA file. Now just click OK.
At this point you should see the VPN server configuration added to the VPN Server List. On the far right, click Activate to enable the VPN connection. After a few seconds, you should see a check mark on the far left under Connection Status. Now you can add as many different server configurations (VPN server locations) to your router as you’d like. If you’re using VPN.ac, you can also add double-hop server configurations. This means your traffic will be routed through two separate VPN servers before exiting onto the regular internet (giving you a higher level of anonymity). For privacy reasons, it would be a good idea to setup both DNS leak protection and IPv6 leak protection. Then at the bottom click Apply. 2) IPv6 leak protection – Select the IPv6 button on the left in your router’s admin area. Now under Connection type, make sure Disable is selected, then click Apply. Now you can test everything out to make sure the privacy settings above are working correctly. A good VPN testing resource is the Perfect Privacy IP check tool. This will show you if the VPN server is correctly replacing your real IP address. You should also run a DNS leak test (also on the Perfect Privacy website). More info on VPN testing can be found here. 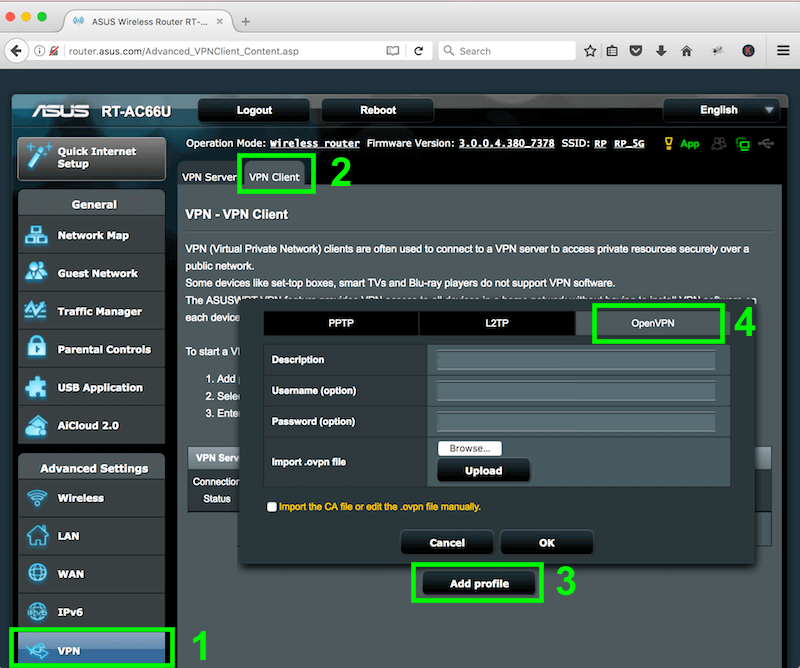 Use two routers – With the VPN router setup in this guide, you can also use two routers: your old router (if you don’t want to go through your VPN), or your new Asus VPN router setup. Because some services block VPNs, such as Netflix, this gives you more flexibility. Finished! That’s it. Enjoy your new VPN router. 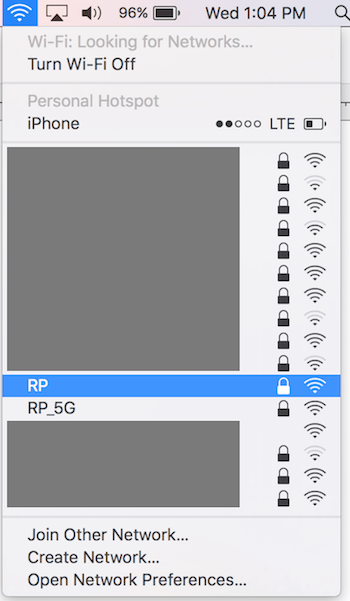 I need wireless wifi package for vpn routers to use it everytime. I need full package for universal sim card and vpns , secured hardwares etc etc where can i find this kind of packages and wireless vpn routers too. 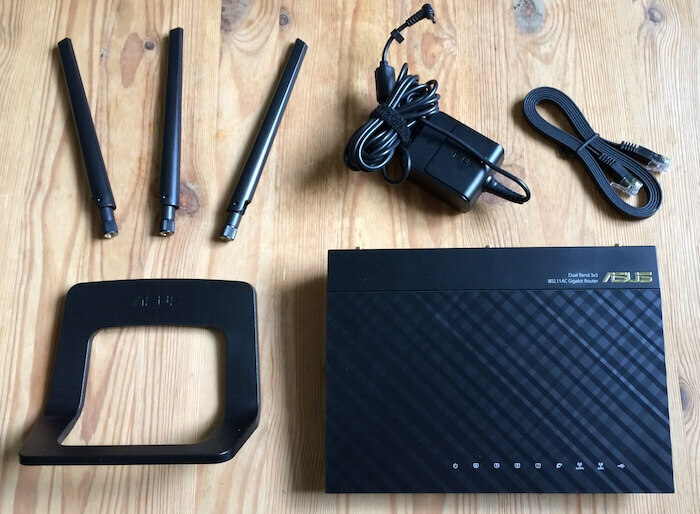 I am based in Germany working, I amtrying to connect my Asus RT-AC51U router to a Fritz!box 6490 Cable modem, and a MAG322w1 to the Asus. I have loaded express VPN onto the router, and followed your very good process. I have tested and changed countires then tested and the Asus appears fine, my lap top shows the area/country that the Asus VPN is loaded for. However when I plug the MAG ITPV box to it, I still get the buffering issues, and I am not convinced it is going through the Router/VPN. I tried to load a test through google on the Mag box using Perfect-privacy but it would not load, I got a ‘unusual traffic message’ and could get no further. Do I have a issue between the Fritz modem and the asus? or can you advise please. Hi Tony, I have never used an IPTV box, but anything you plug in or connect wirelessly to the VPN router should be using the VPN. 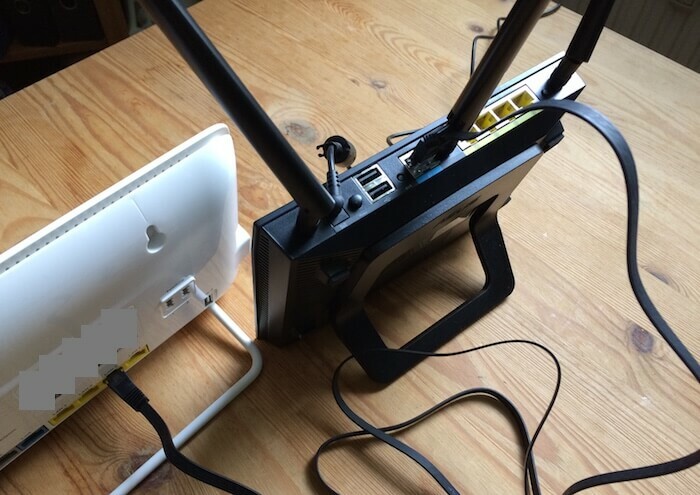 But even with the VPN router connected and running off the Fritzbox, you can still use the Fritzbox for an unencrypted connection, if you don’t need or want the IPTV box going through the VPN. I’d recommend not using the VPN router for the IPTV, unless you really need it, so as to minimize any buffering. Thanks for you excellent website. I would like to set up a VPN router to attach to my primary (non VPN) modem/router (TP-Link Archer VR600v). It seems this might not be possible if the following paragraph is correct. i got the asus rt-ac87u and my internet is 100mbps but when i used the vpn im only getting 20mbps.. what am i doing wrong??? Hi Gilbert, you could try different protocols (UDP vs TCP) or try different servers that are closer to your location with fewer users. That may help. However, even with the AC-87U, you probably won’t get anywhere close to the 100 Mbps speed, simply because the router’s processor can’t handle it. Perhaps speeds in the 40 to 50 Mbps are more realistic for that router. Hi Sven. I am in Portugal with MEO as my ISP and have 100Mb fibre and a Technicolor TG789vac v2 router supplied by them which also has a telephone inlet for my phone service. Wanting to get a VPN I bought, as one of your recommendations, an ASUS AC66U B2 but then found that if I used it as a replacement for the TG789 I would not have a telephone service (no phone inlet). I want the VPN to protect my desktop and 3 MAG boxes for IPTV. If I connect the ASUS to the TG789 as you describe above can I then connect the 4 units through the Lan ports on the ASUS (and a switch if necessary) ? Would welcome your advice. Thank you. Hi David, yes, that is correct. Hi Bob, correct, the connection is going from one of the LAN ports on the white ISP router to the WAN port on the Asus VPN router. Thanks for all the useful reviews and heaps of information. I am about to make a choice about the setup yet I was wondering one issue and that’s the processor speed. I want to buy the Asus AC68U or the AC87U with a faster processor. The big question is what about the modem provided by my ISP? This one seems to have only a 400mhz processor. Would this be a bottle neck or is it only the VPN router that does all the work while encrypting? Thanks in advance. Hi Coen – shouldn’t be a problem. The modem won’t be handling the encryption/decryption, so it doesn’t need the higher processor. The Asus router will be doing all the work. Brilliant site especially for this very old bearded newbie who has spent the last year fuming about the fact that Google affixes a Ticket to you nearly every time you use the Internet and then it is stored in southern California; also I have lost £thousands how I just do not know but I am now quite well up on how to protect yourself whilst on line. 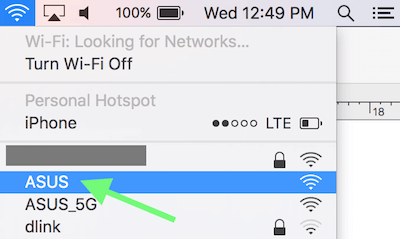 I am thinking of using a “2 router” system (note the parenthisis) i.e. my old Netgear Router and building the Rasperry Pi VPN who’s CPU speed and OpenVPN software would be ok for my needs inclusive of downloading films (legally). It would not of course have all the “bells and whistles” of a commercial VPN or perhaps of an Asus Router/VPN – however there will be no access to any kind of Logs for you know who for instance and I can “play” with addresses etc. to my hearts desire to further confuse them. I fully appreciate that your site is advertising and gives an income and if my plan does not come to fruition then I may well purchase an Asus Router/VPN (have used Asus before good gear). I would be very pleased if you would comment on my proposal and/or point out any problems you see with it. Who knows you may even end up advertising a Rasperry Pi VPN kit – another income. Hi Alan, I have not tinkered around with Raspberry Pis (yet) but it seems to work well for many people. You can find various how-to guides online. I don’t see any problems with your proposal, but I’ve never tried it myself. Just FYI, you can also use the free Pi Hole software if you want to block ads on your network. Regarding the site, my goal is to simply provide people with honest and useful information, while also recommending solutions and products that I would use myself. I explain this a bit more on the Mission page as well. Thanks for stopping by! I am using a 2 router setup as recommended. My Asus router is using the newest Asuswrt/Merlin firmware because I wanted to have a kill switch. I am using VPN.ac as recommended. VPN.ac is not familiar with Asuswrt/Merlin firmware and said that establishing a kill switch at the router level is beyond their scope of tech support. Do you have a tutorial for Asuswrt/Merlin firmware. I am new at this and find your website very informative. Any help would be appreciated. Hi Clifford – glad you like the site. This video on YouTube should give you everything you need. It walks you through the setup in clear steps. The comment section is also full of great information.